Rinsing your fruits and vegetables with water may not be enough to remove harmful pesticide, fungicide & herbicide residues, waxes, oils and deadly bacteria such as E. coli and Salmonella. 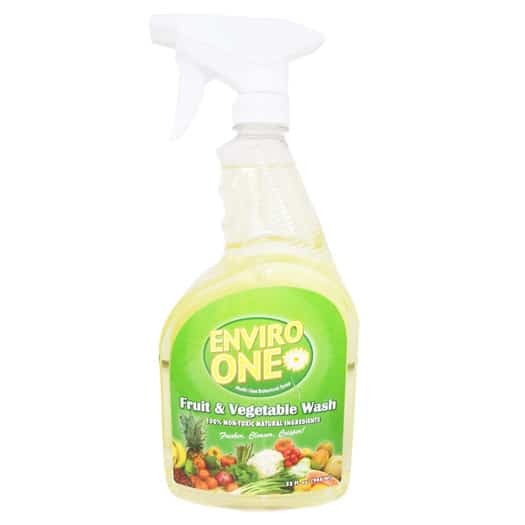 Using Enviro-One Fruit & Vegetable Wash will not only remove these residues but also give you fresher produce with no toxic residues left on your produce. Visit our downloads page to see the Enviro-One Antibacterial Efficacy Testing results. All fruits and vegetables including tomato, lettuce, spinach, apples, strawberries, and more. Place fruit and vegetables in a bowl or sink and spray with Enviro-One Fruit & Vegetable Wash covering them completely. Fill bowl or sink with water enough to completely cover the fruits and vegetables. Let soak for 5 to 10 minutes. Rinse, dry and eat or store. Rinsing your fruits and vegetables with water may not be enough to remove harmful pesticide, fungicide and herbicide residues, waxes and oils. Using Enviro-One Fruit & Vegetable Wash will not only remove these residues but also give you fresher produce.